The Church of Santiago (St.James) was built during 1535 - 1567. The new church was built due to the considerable increase in the population, given that the small church of La Concepción, existing only as an annexe to the church of Santa María de Aledo, was insufficient to house the community in their religious ceremonies. In a meeting between the parish priest and the council on September 29, 1949, it was agreed to buy an ancestral home of Don Alonso Andreo and the house of Juan de Cánovas and on these build the new church. A government licence was obtained and construction started in 1553, under the direction of the mason Pedro de Cayuela. On July 24, 1567 the aforementioned church was blessed and the holy sacraments, baptismal font and archives were processionally moved to it. They were dedicated to the Apostle´Santiago el Mayor´, declaring it the patron of Totana and Aledo. The three naves and the vestry were finished during the first phase of construction. The architecture of the church is, in general, Tuscan, the plateresque front and the inside basilica in style; the poligonal shaped apse stands out with its three naves and six sections, each with a small chapel. Its structure has a perculiarity in that the pillars with longitudinal arches give the building a greater sense of monumentality. The craftsmanship of the Mudejar style roof was done by Esteban Riberón of Lorquí, and it consists of a simple framework of evenly carved pine rafters, similar to Andalusian and Castilian Mudejar buildings. The main altar can be found in the main nave with a big baroque altarpiece of Soloman columns adorned with typical vine leaves. The golden shrine was the work of Antonio Caro ´El Viejo´ of Orihuela. From 1580 the construction of the different chapels which are found throughout the protestant and epistle sides was started. The construction order corresponds to the governing Alonso Ramos, around the decade of 1570 - 80, as a funeral chapel; following his death the altarpiece of the church was decorated in Renaissance style, dedicated to San Ildefonso and whose main theme is the giving of the chasuble from the Virgin to the Saint. Four medallions (circular insets) dedicated to San Francisco, Santiago, San Pedro and San Pablo (St Francis, St James St Peter and St Paul) are conserved inside. Three scenes from the life of Christ are depicted on the inside, The Prayer of the Orchard´ (La Oración de la Huerta), the ´Holy Burial´ (El Santo Entierro) and the ´Fall´ (la Caída) The images of San Francisco Javier and the Virgin Mary are modern, as well as the canvas of the Calvario painted in 1948 by Soriano. It was built as an annexe to the church in 1606 - 1608, in Tuscan style. Its construction is attributed to Juan Fernández and the master-builder Juan de Zabala, of Totana, in this way it shows the Council Act of September 6, 1606, which José María Munuera records as "...in this Town Hall a demand made by Juan de Zabala, master-builder, presented by Francisco de Arranda and this signed delegate...for which requires the said justice, priest and council paid him a third of the two thousand ducados on finishing the work of the tower of Santiago of the aforementioned town...according to the required conditions and obligations..."
The body of the tower is made up of three levels and covered in brick. The interior light comes from three small windows. The last level where the bell is found has two arches on either side and is finished off by a cornice from which they launched the traditional battlements, typical of nineteenth century architecture. The banister of the bell tower was placed there in the summer of 1608. The overall aspect of the tower fits with models erected in the 16th century. 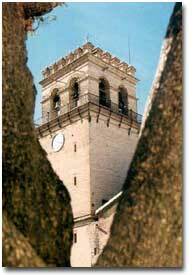 The bell tower´s crutial aims were to alert the town to the presence of muslims, to announce the delivery of water, to signal the start and end of the working day and the same as today - to call the faithful for the celebration of religious rituals. The inner doors of the side door opposite the fountain and the main door were built in 1682 and 1687 respectively. The building was possibly built in the 16th century, although it was restaurated in the current century (1939 - 1940). It´s a typical brick construction of Totana from that era. Here we are dealing with a construction from the beginning of the century, with an historical eclectic style. Consisting of three floors and a semi-basement towards the Plaza de la Constitucion. It is listed as a grade 2 building of monumental interest. From the ground, you can enter by a staircase situated on one side and from there you can reach the successive floors, until you end up in the roof which has an interesting turret for launching battlements. There is a balcony with a mirador at the front of the building on the first floor and a balcony surrounded by small pillars, heavily decorated with mouldings and floral motifs, on the second floor. This idea is also found inside where two atlases flank the access to the stairwell. The layout of the second floor is acheived by means of a passage which opens into twice its size, considerably widening the space and the brightness inside. In front of the church of Santiago, in the 'Plaza Mayor', we find an enormous baroque style fountain built in 1753 by the sculpter Juan de Uzeta and the stonemasons Juan Moreno and Pedro Litrán, according to the designs of the painter Silvestre Martínez of Totana. The neccesity for this fountain arose due to the considerable increase in the population of Totana, where the water supplied by the Frailes Fountain was insuffient and because the Franciscan community frequently used it leaving the population, almost on a daily basis, without water. Thus, the first ideas to provide the town with a public fountain appeared with the practical aim of ensuring the provision of water for the people. The chosen spot for the construction of the fountain is the 'Plaza del Pueblo', opposite the Church of Santiago, where the access roads from Lorca, Mazarron and Murcia meet. The work is a hexagonal shape with a pink and black jasper bowl, brought from the quaries of caravaca; into this bowl pour 18 lion heads and on top of those is a column supporting the superior bowl. On top of this bowl you can see, amongst other numerous carvings, three cherubs forming the three jets which pour into the superior bowl. It is topped off with the City and Coronation Coat of Arms, of alabaster and above that the Cross of Santiago. The fountain is enclosed by nine columns linked together with chains. Originally this was a church dedicated to the medicinal saints Cosme and Damián. It was designed by the architect of the Diocesis, Don Justo Millán Espinosa, who also built the Teatro Romea in Murcia, the Church of la Caridad in Cartagena and the cemetary in Totana. Subsequently in 1894 its function as a prison for the district was redeemed and nowadays it houses the Town Cultural Centre. It also houses the Universidad Popular (popular university). This is the former church of ´Nuestra Senora de la Concepcion´, the first town church, later in the 16th century it was a hospital. Originally it had a social service function and offered refuge to travellers, old people and tramps; under the care of the town council. The architecture is not outstanding for its decorative features, its more like, according to José María Munuera, a domestic house consisting of a central patio with two flats and a series of rooms - possibly bedrooms - of a reduced size. Later the building was reused with two of the areas being put to collective use. The current building is neogothic in style. Opened in 1604. This was the year that the Franciscans from Alcántara were put in charge of the convent. This Order originates from the Reformation of San Pedro (st. Peter) of Alcántara established at the end of the Council of Trent. The old Convent of the Franciscans was conferred to the Town Council following numerous requests made to the monarch, given that the Church of Santiago was insufficient to meet the worshipping demands of the neighbours. It´s in 1602 when the Franciscan Order was established in Totana and the donation of the Hermitage of San Roque was made together with the sunny annexes for the convent building that was to be housed in the Triana district. It´s in this district where quite possibly there lived the most marginalised minorities who were urgently in need of integration into the religious life of the town. The constructiuon of the convent was finished one year later, founding the San Buenaventura Monastery. The present day church is Renaissance in style and the 17th century cript can still be found inside. In the stone chapels you can see carvings, such as faces, some of which have excellent features. Situated in the slope of a hill, surrounded on the South and East side by stone walls and the rest of the building by an inner courtyard which allows access to the three flights of steps leading to streets San Roque, Santa Eulalia and La Monja. The namesake of this hermitage has been considered, since the middle ages, as a protecting Saint against the constant epidemics which affected the population. Its a Tuscan style building where inside there is a rectangular floor with only one nave, covered with a semi-circular dome supported by rolls of arches and semi-spherical cupolas on the transept; adorned with eighteenth century pictures of floral motifs in garlands or chains in blue and red tones. On each side of the aforementioned nave there are five chapels. In the main altar, in a niche covered with glass, you can find the wooden image of San Roque, and on top of this a painting which depicts Saint Domingo receiving the blessed rosary from the hands of the Virgin Mary. In the arches which support the cupola of the transept there are four oval shaped insets with wall paintings, which are trimmed with imitation marbel, a red tone streaked on white. Its situated in the middle of a small hill. It was built following the increase of the population of the small town of Totana during this century and in the "... need for the people of this district to hear mass, who for their poverty lacked decent clothes in order to attend a local church with the decorum that one owes to God...". This provoked the inhabitants into asking the Town Hall to build the aforementioned hermitage, and the work began in 1693. On April 17, 1697 the said Hermitage was dedicated to the Order of the Bishop of Cartagena. With time the hermitage deteriorated due to its state of abandon and the number of worshippers became almost nothing. It only gave mass in the Rogation Days (April 25 and the Monday, Tuesday and Wednesday before Ascension Day) or when a worshipper requested it. For this reason its restauration started in 1749 under the direction of the skilled workman Alonso De Costa.